What an amazing promise. 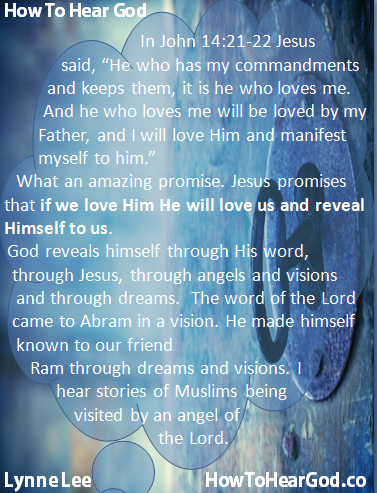 Jesus promises that if we love Him He will love us and reveal Himself to us. God reveals himself through His word, through Jesus, through angels and visions, and through dreams. The word of the Lord came to Abram in a vision. He made himself known to our friend Ram through dreams and visions. I hear stories of Muslims being visited by an angel of the Lord. Pay attention to your dreams. Ask the Lord to help you understand the dreams He causes you to dream. If you would like help to learn how to understand your dreams I recommend you check out this coaching guide. You will find bonus resources that help you to understand your dreams.